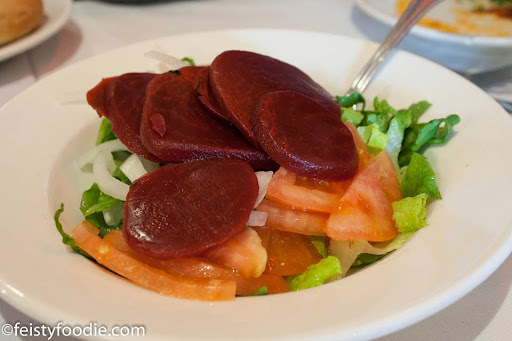 I’ve written about Mi Tio twice now – here and here – that first post so long ago that it was when I still used flash in my food photos, oh the horror, the shame! – and explained that I’ve been going here since before my dad died. Since before the pizzeria next door burned down and they expanded into that space – since they were still very hole in the wall, since the complete skirt steak was a total steal at $17.95. I decided to pop in and see if anything had changed… and because I was craving red meat. 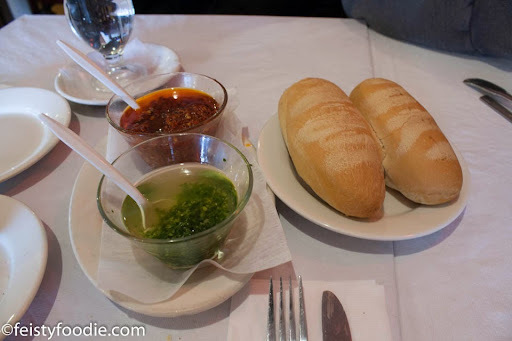 Chimichurri – spicy and not – and warm bread that I just realized they bake in-house. The bread is awesome – a nice crisp but thin exterior, and fluffy hot insides that the butter provided melts quickly into – and if you’re into it, I also put chimichurri on that bread. SO GOOD. 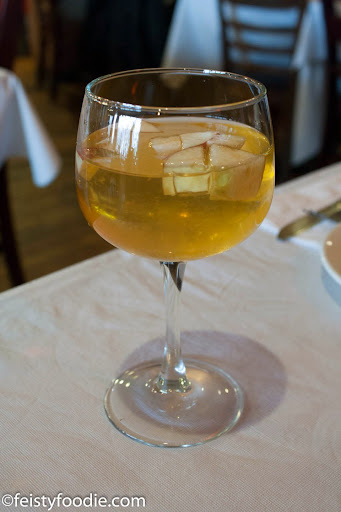 Dessert Zombie and I split a small pitcher of their white sangria ($14). A decent amount and while it was like drinking juice, it packed a good punch – I got tipsy, and he turned super red. 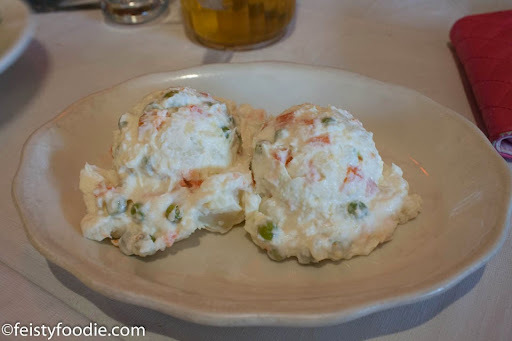 I always get the Russian potato salad for my side – creamy, soft, and spiked throughout with frozen peas and carrots, it just works for me. Mr. “I can eat anything!” ordered a house salad for his side. I ate all his beets. They were canned, but I like beets, so it worked out. half skirt steak (which Mr. “I can eat anything!” also ordered). Which was delicious, tender, juicy, and cooked to medium rare, slightly closer to rare. 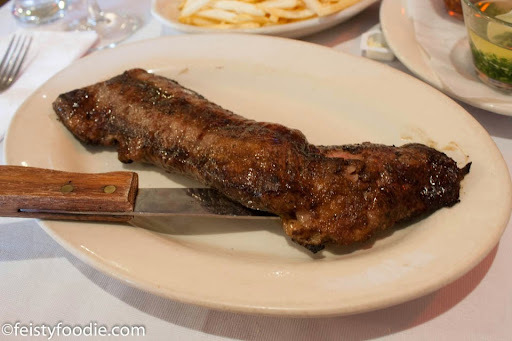 Notice, though, that in previous posts, I stated that I always get the skirt steak completa/full skirt steak, and this time I only ordered the half. Why? Because the price on the half was $27.95 and the full was $33.95. The price has steadily increased to the point where ordering the full is no longer a raging bargain… which is fine, but no need to order it then. As it was, I ate about half my steak and took the rest home. But not before making it into a steak sandwich with a piece of their bread, slathered with lots of chimichurri. Oh man, that was a delicious lunch the next day… so freakin’ good. Though it’s no longer the amazing deal it used to be, I still thoroughly enjoyed my meal and will continue to go back when I’m in the mood for Argentinean steak! Tipsy evil twin so mean. Ha. Steak was aight…mine was on the grisly-side…dollop dollop both sauces. First time back in about 3+ years. Oh dear, are we at the age where we can say “back in the day, blah blah cost this much”? Hahaha!